The EWCPS 2015 will take place on the Natural Science campus of the University of Münster. 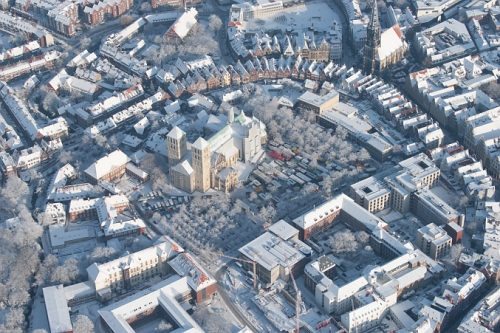 The campus is in walking distance to the historical city of Münster (about 15 min. walk). Münster is a multi-faceted city. It is a city of science and learning, the City of Westphalian Peace, the capital of bicycles and Germany’s Climate Protection Capital. Westphalia’s long- standing regional capital is a young city, not least thanks to its 50,000 students. It is an outstanding place to live, work, learn and research. Founded more than 1200 years ago, the city looks back on plenty of history. In 1648, Münster became a city of peace when the Treaty of Westphalia was signed here. After the Napoleonic era, the city became the capital of the Province of Westphalia. Severely damaged in World War II, Münster was rapidly rebuilt in the 1950s. Today, the combination of old street network and modern buildings attracts a large number of tourists from all over the world. In 2004, Münster has been awarded the title of „World‘s Most Liveable City“ (LivCom Award 2004). With close some 300,000 inhabitants, Münster is an important economic and scientific center in the northwestern part of Germany. It can easily be reached by plane, train and car. The city hosts the University of Münster and the University of Applied Sciences, both together currently educating some 50,000 students in more than 180 disciplines. In Münster you find everything you can wish for during an exciting short stay: A city with plenty of history as well as shopping opportunities and a unique supply of activities to enjoy art and culture alongside other pleasures.